Way up north, lightning flashes, thunder rolls, and the frogs sing a chorus. 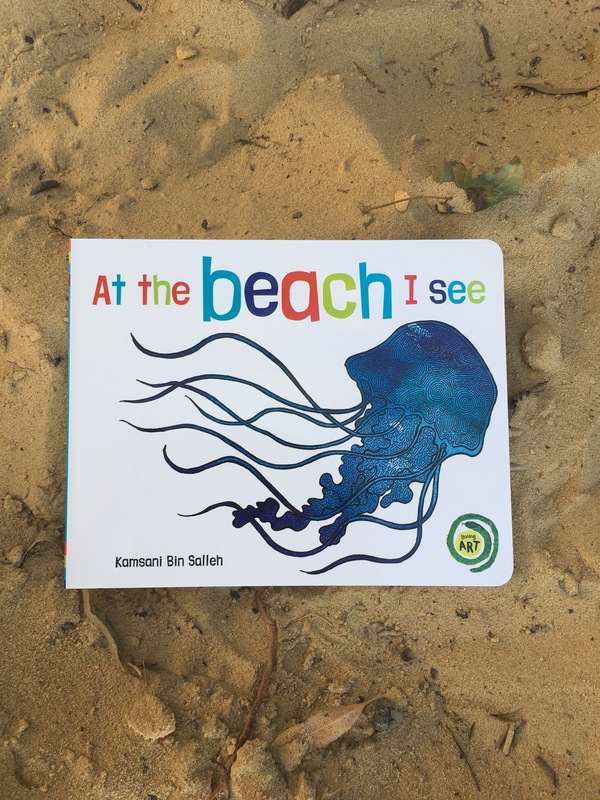 The magic of the summer rains is wholeheartedly felt throughout this picture book. Living in a place where life blossoms almost immediately after the first rains would be a magical place to be. 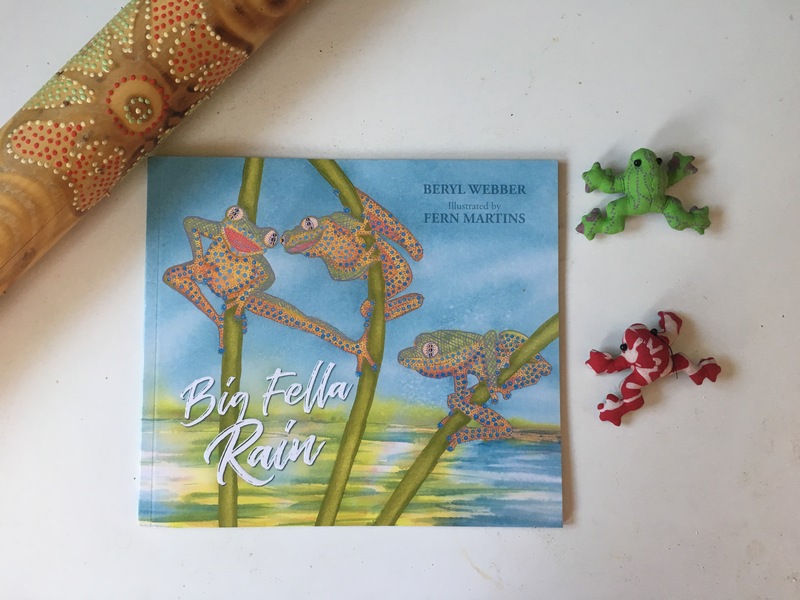 This book, Big Fella Rain by Beryl Webber and Fern Martins and published by Magabala Books, is a celebration of life and the reliance all living things have on rain. Figurative language abounds in this story from liquorice clouds, cracked earth, iridescent wings and thirsty reeds. You can feel the world come to life through the story and see it grow in colour through the illustrations. Big Fella Rain allows the reader to explore how life changes when water plays its role. We can see seeds looking for somewhere to sow themselves, animals drinking up the long-awaited water and rivers forming to support life. The subtle changes of colours in the illustrations throughout the story show the life return to the red sand and cracked earth. Big Fella Rain is a celebration of the start of the rainy season – the clouds building, the animals retreating and the cracked earth waiting. It is a celebration of the seasons in the Top End of Australia and the delicate nature of the natural world. 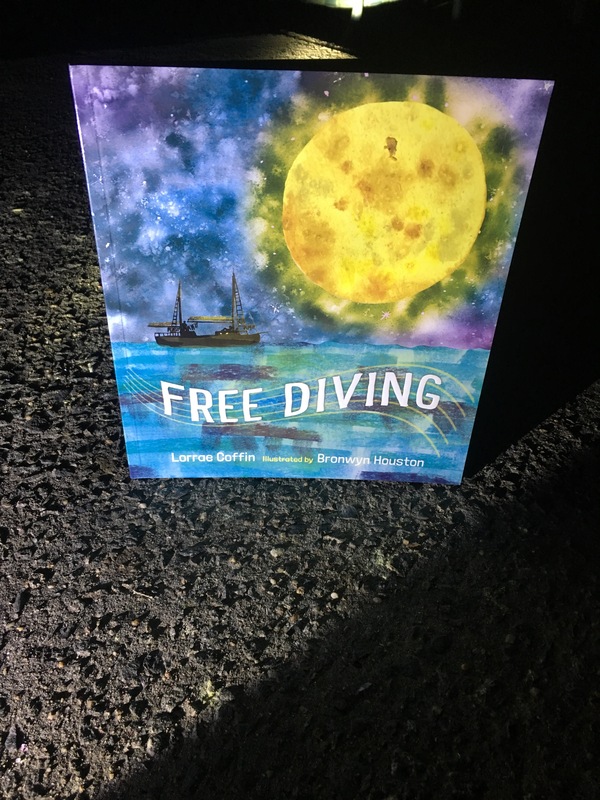 Fern Martin’s illustrations are exquisite and the details she adds to the animal features or the subtle changes in the sky add more depth to the story and show the young reader just what life looks like as the rain falls. We loved reading this story, looking at the details of the insects, listening to the animals cry for joy and watch the water as it made it’s presence. Big Fella Rain is a wonderful picture book to read out loud, pour over the pictures and think about how much we rely on water. How do you rely on water? How much water do you need? How much water does your garden need? Explore the seasons in the Top End of Australia. Explore which animals and plants rely on the rainy season to help them live or have more babies/spread seeds? Why is this called “Big Fella Rain”? In this story ‘Mother Earth is happy’ at the end. Why is she happy? Is she ever sad? How can you take care of the waterways near you? Which type of tortoises live in the Top End? What is the difference between a turtle and a tortoise? What are Brolgas? Emus? Which other large water birds live there? Are there any frogs endemic to the Top End? We often forget about insects but they also play a role in this story – how do they cope with the rain? Where might they go when it is too wet? Are any animals endangered due to climate change? Less rain or too much rain? Damage from mining or pollution? Explore the art work by Fern Martins – Explore how she has created the illustrations in this story and her other artwork. Have you ever experienced the start of the rainy season? I would love to hear your stories! 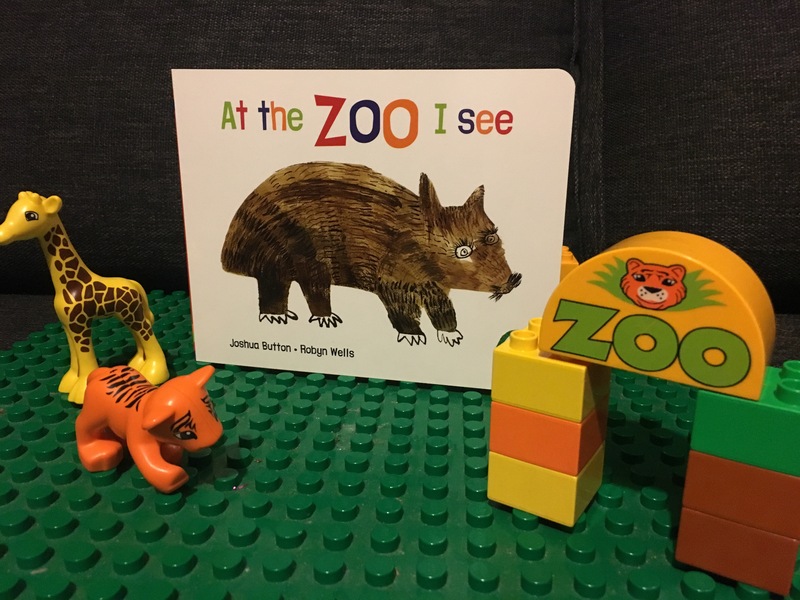 At the Zoo I See by Joshua Button and Robyn Wells and published by Magabala books is a vibrant board book for younger readers. 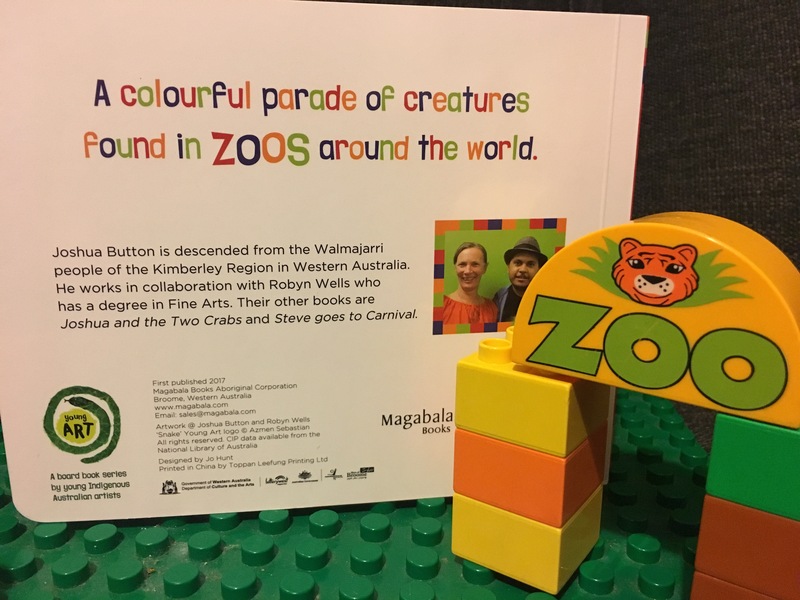 At the Zoo I See is a colourful parade of creatures found in zoos around the world including many wonderful Australian animals. As you turn each page your child will be delighted by the vibrant pictures of animals you can see at the zoo. I loved the adjectives used in the short board book as it gave each animal more meaning to how they move about in their daily life. We loved discussing why the cassowary was queenly! At the Zoo I see is another harmonious collaboration between Joshua Button, a descendent of the Walmajarri people and artist Robyn Wells who resides in the Kimberley area. Each animal is true to it’s colour in nature and is depicted as alive and alert. This board book is part of the Young Art Series which showcases the work of young indigenous artists. Zoo’s are an important part of a natural world especially with the destruction of animal habitats every day all over the world. It is important that we make our children aware of the wonderful animals that their local zoo takes care of. Although zoos may seem cruel in that the animals are caged, without this many of the animals we see at the zoo would already be endangered or extinct. 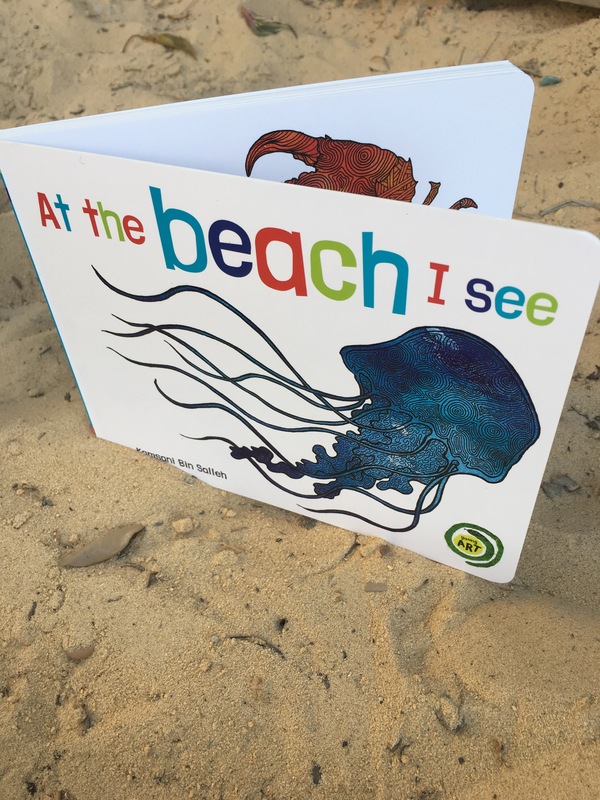 Board Books are a wonderful way to start your child reading and At the Zoo I See connects creative sentences alongside colourful pictures to mesmerise young readers and allow them to learn more about animals and reading. So how can you link this book to other activities? Talk about the animals in the book and perhaps explore theses animals further through research, other books and videos of the animals. Go to your local zoo and find out more about the work the people at the zoo do for the animals. Wombats, Quolls and Cassowaries are all Australian animals – find out where they live, how they live and how they are effected by feral animals and habitat destruction. After finding out more about each animal, try to think of other adjectives that could describe the animal. What other words start with the same sound as the animal? Have some fun with alliteration such as wobbly wombat, quokka on a quest and calm cassowary. For older readers work out which animal is first if put in alphabetical order. Find out what the animal names are in your local indigenous dialect. What is the young art series and how is this helping young indigenous artists? How are different Australian animals important to different Indigenous groups of Australia? Which Australian animals live in your area?